From Main body of report: The first [explosion of firedamp] will probably be considered an unusual disaster. 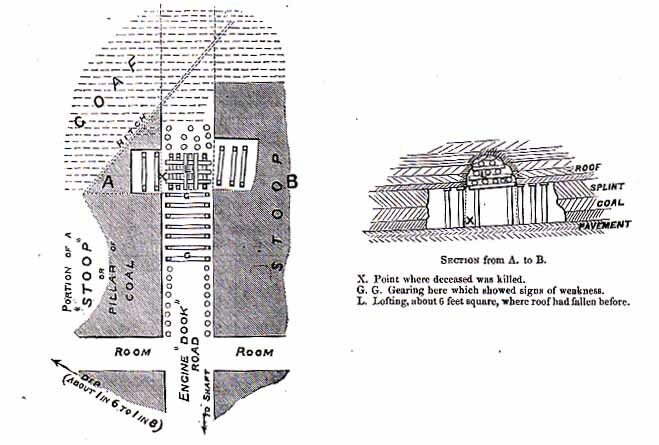 The operations in the pit were at the time principally confined to the "dip." It appears that on the night of the accident, and whilst the "brushers" were at work, the water courses in close proximity to the shafts (upcast and downcast) had overflowed in consequence of the heavy fall of rain which prevailed at that time, and to such an unusual extent that the water forced its way into both shafts. The effect of this was to render inoperative the upcast shaft, which slowly produced stagnation of air in the workings. I understand that the persons employed under ground at the time first discovered the change in the air about midnight. The ventilation, which previous to the fall of water in the upcast shaft was adequate, would gradually become insufficient, and the circumstances of the case were explained by Jardine, the neighbour of the deceased as follows:" On discovering the change in the ventilation I was aware that something was wrong, but supposed it might be occasioned by some neglect of a trap door, which I knew, if left open, partially allowed the air to pass to the upcast without travelling round the working faces. I left my neighbour with the intention of examining the door, or discovering where the fault lay, but on leaving I cautioned him about remaining long if I did not return soon." The explosion took place shortly after, and I have no doubt was occasioned by the naked light of deceased coming in contact with the air around him which had become explosive. Jardine was the only one who knew of the deceased being left in the workings, and probably he was the only one who could form a correct idea of how the explosion took place, but in the scramble and confusion caused by the blast, and the rush of water, which at the time was forcing its way down the "dook," every one appears to have considered it a struggle for life, and Jardine, I understand, was one of the first who reached the pit bottom. It was some hours before the pit was in a state to admit of a search being made for the unfortunate sufferer who was found dead not far from where his neighbour had left him. From Main body of report: A joiner, engaged with two neighbour workmen dressing a log of wood for a pithead frame, overbalanced whilst in the act of turning it, and missing his footing it fell upon him. He was severely injured, and died from the effects of his injuries. From Main body of report: Happened whilst the sufferers, the fireman being one of them, were engaged removing an accumulation of firedamp which had taken place in a part of the mine in consequence of a downfall of water from a lodgement in the upcast shaft caused by the accidental stoppage of pumping operations, and which deranged the ventilation. The time chosen for performing the necessary work of removing the firedamp was at night when the workmen were absent, at which time there was danger to the fewest possible number of persons, and apparently there was nothing objectionable in the method. If no other than safety lamps had been used, as required by general rule No. 7, the firedamp would in all probability have been removed without accident. 1877 February 27 Lochend New Monkland, LKS James Nimmo & Co Malcolm Barnes Labourer 37 In shafts  falling into shaft from surface He ran a hutch into the shaft at the low scaffold when the cage was not there. 1877 March 2 Newlands Bothwell, LKS Dunn Brothers Jas. Docherty Drawer 16 In shafts  falling from part way down Fell from a mid-working. From Main body of report: Happened at Souterhouse Colliery, near Coatbridge. At the time of the accident the engineman was in the act of winding the cage with the manager on it to the surface. By the explosion of one of the boilers he lost control of the machinery, and the cage, which was near the surface, was drawn over the pullies, and the manager either fell off the cage, or, in attempting to get out, stumbled into the shaft and thence to the bottom, a depth of 116 fathoms. The engineman was severely scalded, and died from the effects of his injuries soon after. At the request of the Procurator Fiscal, Mr. Stevenson, Engineer, Airdrie, made an examination of the boiler immediately after the accident, and reported " the cause of the disaster appears to me to have arisen from a deficiency of water in the boiler which exploded. The water evidently had been allowed to fall to within six inches of the bottom of the boiler. The indications of the water lines and the fire lines are quite distinct, and one of the plates showing these indications was cut out and retained for reference if required." From Main body of report: A " trimmer" or screeman, whose, business along with others, was to see the waggons properly loaded, and to shift them from the loading place or screen into a lye a short distance from the pit, was in the act of shifting a loaded waggon, and when attempting to place a " sprag " between the spokes of one of the wheels he missed his footing, or in some way got caught by the " sprag " when revolving with the wheel, and was thrown upon the rails, and fatally injured by the waggon passing over him. From Main body of report: Report by J. T. Robson, Assistant Inspector of Mines. I examined into, and saw where this accident occurred on the 19th instant. It occurred in the splint coal workings, which are now confined to the removal of the pillars or "stooping.'' The seam is about six feet thick, and the pillars are 14 to 16 yards square. It appears that deceased and four other colliers worked in the "dook" portion of the workings. When they left the place on Saturday evening they expected that work for a day or two might still be got off the part of the pillar they were engaged at, and they left the roof supported on props so that they might commence on Monday morning. When they went in on Monday morning the oversman, James Anderson, and fireman, John Moreland, accompanied them, the fireman having previously inspected the colliers' working places and roadways. They did not think it safe to work any more coal off, and the oversman gave instructions to draw as much of the wood out as they could with safety. The props could have been taken out without much extra risk, but the road for retreat was not so safe, and the oversman mentioned this circumstance to the colliers, and particularly to David Faries, the most experienced of them. It appears, however, that deceased went forward and commenced to draw them out, when the roof round about gave way and he was caught by a falling crown while endeavouring to pass out. He was not killed immediately, but owing to the quantity of debris which fell, and the time which it took to extricate him - about two hours - he was dead by that time. From Main body of report: A boy about fourteen years of age was employed to assist on a pithead, and his principal work was to push the empty hutches on to the cage when the full ones were removed. On the day of the accident, the waggon trimmer had occasion to shift empty waggons from the " lye " to the scree, for the purpose of loading. On this lye there is a gentle incline, so that the waggons, when once put into motion, unless controlled, move slowly into the scree. The deceased had gone with the trimmer to shift some waggons, and whilst doing so part of the train of empty waggons left behind had got in motion and come in contact with the one deceased was attempting to " drag," which caused him to lose his hold, and, falling on the rails, he was run over before the waggons could be stopped. It was the trimmer's duty to shift the waggons when required. He needed no assistance, and according to the explanation given by the pitheadman he had reproved deceased more than once for leaving the pithead and interfering with the waggons whilst being shifted. From Main body of report: A labourer, upwards of 75 years of age, whilst disloading pit-wood from a truck or waggon in a siding or " lye'' received injuries which were at the time not considered serious but proved fatal some time after. It appears that the locomotive engine-driver connected with the colliery had occasion to shunt waggons in to the " lye" where the truck with wood was being disloaded, and seeing the deceased and his neighbour upon the truck, he gave the usual signal before doing so, which they acknowledged. The survivor explains that he remained on the truck, but the deceased after getting off it and clear of the rails, on observing a length of wood partly on one of the rails, attempted to remove it, but got entangled with it and the waggon put in motion by the locomotive. From Main body of report: Occasioned by a certain amount of irregularity. It appears that deceased, on the day of the accident, after completing his day's work, had inadvertently gone in to a place, not at the time being worked, where he expected to find some tools belonging a neighbouring workman, which it was reported he had arranged to remove. According to the 75th special rule of the Colliery, "All workmen are prohibited from entering or remaining in any place throughout the whole mine where not absolutely required by duty to be at the time." This is a very proper and necessary regulation, which the deceased unfortunately failed to observe. However, there is an equally important general rule No 4., and bearing upon the management, which provides for fencing off places "not in course of working and extension." The place where the explosion happened had not, I understand, been worked for two months or thereby, and for eight days or more before the accident the brattice, which had been led in to the face for the purpose of ventilation while being worked, had been removed. On this being done, it was clearly the duty of the person directing the alteration to erect a fence at the entrance, and had this precaution been observed the accident would in all probability have been prevented. 1877 July 19 Hill of Beath Beath, FIF Ord Adams David Innis Collier 30 Falls of Roof At face. Stoop and room. From Main body of report: A waggon shifter, whilst assisting to remove an empty waggon out of a " lye " was overtaken by an empty waggon pushed by a neighbouring workman, which either unknown to the deceased or in his attempt to get out of its way caught him, and he was crushed between it and the waggon in front, and died from the effects of the injury. From Main body of report: Happened at Cowie Colliery, a small work near Stirling, during the night, whilst the engine was pumping water. The engineman was badly scalded, and died from the effects of the injuries. Mr. McColl, Engineer, Glasgow, at the request of the Procurator Fiscal, made an examination shortly after the accident, and reported as to the cause of the explosion. Summing up, he remarks : "I find that the explosion was due not to any special defect in the boiler or its fittings, nor to any specially negligent mode of working it, but rather to the fact that the type of boiler, cylindrical, externally fired, is a very unreliable one. Boilers of this class are subject to great variation in the expansion and contraction of the parts. In raising steam from such a boiler as this, supposing it to be filled with cold water, we have all the heat of the fire on the one side of the boiler, and only the temperature of the atmosphere on the other, and the great difference of temperature must be maintained until steam has been raised and the boiler heated all over. It will be obvious that under these conditions the bottom of the boiler expands or will be increased in length while the top remains in its normal condition, and it will be readily understood that this must exercise a severe straining effect upon the transverse or circumferential seams of rivets. On the other hand, it will be easily seen that in ordinary work the opening of the fire-door for any length of time must admit a current of cold air along the bottom of the boiler, reducing its temperature and thus tending to contract it, and this must also have a straining effect upon the transverse seams of rivets. It is not, therefore, surprising to find that the transverse seams of rivets in this class of boiler are frequently found fractured from rivet hole to rivet hole more or less extensively. When a fracture has extended a certain length some very small circumstance may be sufficient to cause such an extension as to result in the sudden explosion of the boiler, and, as a matter of fact, such boilers rarely give any warning before exploding. There can be no doubt that the explosion in question occurred in this way, but of course, under the circumstances, I am unable to point to any particular circumstance as causing the explosion at this particular time." Mr. McColl points out that "the loss of life and property through the explosion of this class of boiler may be greatly reduced by tying the two ends of the boiler together by means of a strong longitudinal stay running through the boiler from one end to the other and firmly secured, while this would probably have little effect in preventing the explosion itself it would, by preventing the two ends of the boiler from flying apart, greatly reduce the possible amount of damage." 1877 August 18 Broxburn Uphall, Linlithgow Robert Bell J. Bryans Brusher 24 In Shale mines Run over on engine plane. 1877 August 22 Poneil Limestone Lesmahagow, LKS Hamilton and Co Robt. Callan Miner 40 Metalliferous mines Fall of rock at face while boring a hole to blast it. 1877 August 25 Whitehill Lasswade, Edinburgh Arch. Hood John McLeonards Collier 41 Falls of Roof At face. Stoop and room. 1877 September 11 Craighead Blantyre, LKS Wm Baird & Co Hugh Burns Sinker 45 In shafts  things falling from part way down They were struck by some wood and debris which fell down the shaft. From Main body of report: These men were all sinkers engaged in No. 2 pit, Craighead, belonging to Messrs. Wm. Baird and Co., and about 7 p.m. an explosion of gas took place in the shaft with the above result. The pit is being sunk and is now 163 ½ fathoms deep. It is 23 feet long , by 7 feet wide. All the men and materials descend and ascend by the downcast side. Robt. Paterson is manager, and his two sons, John and William Paterson are contractors. At the time of the accident the ventilation was caused by a steam jet placed 8 1/2 fathoms down the upcast. 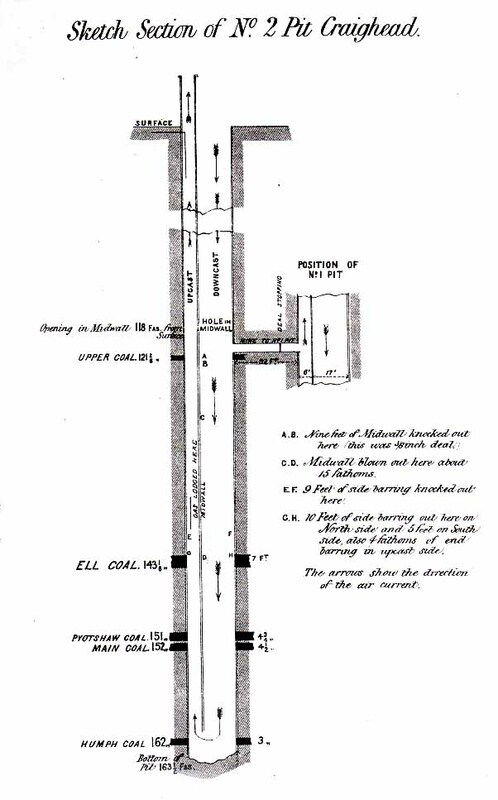 The Upper, Ell, Pyotshaw, Main, and Humph seams of coal (see section) have been passed through, and the sinking continued two fathoms below the last named seam, which point is supposed to be within 12 or 14 feet of the splint or lowest seam of coal. Fire-damp was given off while passing through each seam, the greatest quantity being at the Pyotshaw and Main. There was no gas issuing from the bottom of the shaft at the time of the accident, and the sinkers were using naked lights, but had gauge lamps which they used to examine the bottom after firing "sumping" shots, when fresh feeders of gas were most likely to be struck, or for going into the "upcast" or working in the shaft near any of the seams of coal which have been passed through. Between 6 and 7 o'clock in the evening the five men who worked in the bottom were up on the pithead getting their "piece." John Paterson, one of the contractors, saw them and arranged with James Robertson, chargeman of the shift, to put on the plumb lines the first thing on their going down. 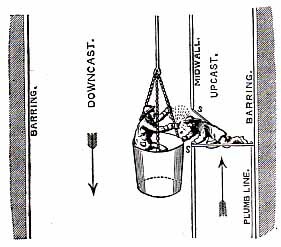 The plumb line for one side of the pit was fixed in the upcast at a point 118 fathoms from the surface, and was reached by an opening in the midwall which was covered with canvas to prevent loss of air. The opening was 3 feet high and 2 ft. 6 ins. wide. A few minutes to 7 o'clock, Burnes, McGill (both deceased), and Garrety got on the ''kettle" and went to the bottom with naked lights; they sent away a load of stones, and about five minutes afterwards Robertson, the chargeman, and Ricd. Pollock descended. They stopped 118 fathoms down at the place for hanging down the plumb lines, and it appears Robertson remained .on the kettle while Pollock stepped off and passed through the screen (S.S.) into the upcast side. They say they had been told there was fire-damp in the upcast, and as they had no safety lamp Pollock went through in the dark and adjusted the plumb line, the only light being what shone through from Robertson's light on the "kettle." Having adjusted the line, Pollock was in the act of returning through the opening to get on the kettle again, when an explosion took place. They were both slightly burned but managed to return to the surface. The force of the explosion knocked out several fathoms of midwall and also some of the barring, which, falling down the shaft where the other three men were, killed two of them and injured the third one, Garrety. None of these three were burned. The ventilation of the lower part of the shaft was destroyed by the broken midwall, and repeated efforts failed to reach Garrety, who was held fast by the fallen debris in the bottom of the pit. The brattice was repaired temporarily and water run down to dispel the gas which had accumulated, and about 3 a.m on Wednesday Garrety was rescued and is likely to survive. After the recovery of Garrety and the failure to hear anything of the other two, it was judged that they were dead, and it was deemed advisable to make the shaft safe where the explosion had damaged, and postpone the search till this was done. The bodies of the two men were recovered on the evening of the 13th. I examined the place carefully on Saturday, and I find that the principal seat of the explosion has been about the Ell coal seam, about 144 feet below the point where the men entered, and doubtless the gas came from this seam and from the Main and Pyotshaw seams, which are notoriously fiery when newly cut. I am not able to say whether the gas was ignited by the men in the shaft or the men in the bottom; it may have been either, although I am inclined to think the men in the kettle did it. The accident, however, was caused by an accumulation of gas which might reasonably have been expected unless driven away by sufficient ventilation. There was not the slightest difficulty in doing this, and I think the managers and owners are to blame for neglecting to do it. When Pollock was in the upcast the screen was open, and no doubt a portion of the air would pass through the opening, but I do not think this would have had much effect if the pit had been sufficiently ventilated. The machinery and other arrangements of the colliery are very good, and this is the first accident of any kind that has occured in this large undertaking during the two years it has been in operation. 1877 September 12 Blair Lesmahagow, LKS Craignethan Gas Coal Co Robt. Fyfe Collier 20 Falls of Roof At face. 1877 September 14 Carronhall Bothkennor, STI Carron Co Henry Fairlie Labourer 21 Falls of Roof At edge of shaft while putting in brick arching. Long wall. Jos. McLeish Miner 21 Fall of roof at face. 1877 October 16 Cornsillock Dalserf, LKS N Cochrane & Co Walter Halley Fireman 40 Explosion of Firedamp Came unexpectedly on gas in going his rounds. He had a naked light. From Main body of report: By a crane getting out of gear a general underground manager lost his life. At the time of the accident he was superintending the raising of plates upon a scaffold from a lower platform by a crane worked by two labourers. I understand that they had been engaged at this work for two hours, when the crane got out of gear, and the scaffold, with the deceased and two plates upon it, fell a distance of 18 feet or thereby, on to a temporary covering at the pit mouth, which proved insufficient to bear the weight, and from that they fell to the bottom of the pit, a distance of 50 fathoms. In all probability the deceased was fatally injured by the fall, but otherwise he would have been drowned, for when found he was under water. In this case the check upon the pinion shaft of the crane, designed to prevent it getting out of gear, does not appear to have been very effective, but beyond this, the planks placed across the pitmouth were absurdly weak. 1877 November 6 Arniston Cockpen, Edinburgh Arniston Coal Co. Ltd John Sneddon Collier 18 Falls of Coal At face. Stoop and room. From Main body of report: Took place when the deceased who survived the accident nearly a month, was engaged with his neighbour stowing up an old road where it was known that firedamp existed. It was stated that before commencing work the fireman provided them with safety lamps. It was not admitted by either the deceased or his neighbour that they used open lights, but owing to the small quantity of gas which existed the inference is that they did so. 1877 November 10 Chapelhall New Monkland, LKS Monkland Iron & Coal Co Ltd Wm London Miner 20 In Ironstone mines Fall of roof at face. 1877 November 11 Southfield Lesmahagow, LKS Nitshill & Lesmahagow Coal Co. John Crichton roadsman 42 Underground  suffocation by gases Suffocated by heat and steam, &c. in a drift used for return air-way and smoke and steam from engines, while examining it. From Main body of report: Happened to an engineman, who at the time of the accident was engaged pumping water, and whilst moving about the bellcranks got caught between one of them and the wood which formed the enclosure or fencing, and so was crushed and fatally injured.